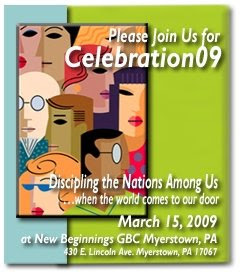 The 2009 celebration of God’s work among the North Atlantic Fellowship district will be on March 15, 2009, at New Beginnings Grace Brethren Church in Myerstown, PA. The cost is $10 per person and includes our fellowship meal. For those attending the meeting, but not attending the meal, the cost is $3.75 per person.